If real architecture is particular to a place, and unique as well as imaginative, then what do we call Unico Properties' new project called inhabit, described by some as the iPod of apartments? It's a stack of two sleek, one-bedroom apartments with private decks, resting lightly on the rooftop park below the tower of Rainier Square. Unico plans to ramp up production of these units, which can be snapped together as apartments on in-fill sites. Architecture? You bet, right off the floor of a factory in Burlington and trucked down the highway to Seattle. The design team, Mithun and HyBrid Architects, is dedicated to realizing a modular, pre-fab building type that HyBrid has been exploring for years. Inhabit is a modular apartment prototype designed by Mithun and HyBrid Archtects for Unico Properties. Sleek, sturdy and small, the units offer private decks and floor-to-ceiling windows. We're talking about housing that is smart but minimal, built largely off site, and made to fit almost anywhere. Despite the downmarket image that clings to pre-fab, distinguished architects have led the way. Their goal is to cut through the economic barriers that put real architecture out of reach to most people. Increasingly, their reasons also include sustainability. There is something essentially modern about this. Early proponents hailed the coming of the industrial age, and the advent of new building methods and materials. Although Frank Lloyd Wright turned his back on European modernism and the International Style, he didn't have any problem with designing something to be replicated easily and cheaply, as his Usonian designs show. In the Northwest, a handful of post-war architects, including the young Fred Bassetti, pitched in to make plans for simple, modern houses available to people of modest means. It didn't bring builders or architects much profit, but it created some residential prototypes that are still fresh today. But even Wright found that his kit-style, no-frills houses exceeded cost expectations on the ground. And so the story goes. Design magazines have been publishing experiments in stock designs and pre-fab parts in recent years, featuring architects like Michelle Kaufmann and Jennifer Siegal. But the homes on these pages are for single families, couples and individuals, and the per-square-foot costs have been disappointingly high. “It would be nice to bring pre-fab to the masses,” said HyBrid's Joel Egan, “but we're not going to do it one house at a time.” He and his partner at HyBrid, Robert Humble, have experimented with using recycled shipping crates in modular construction. The crates, they point out, are capable of surviving drops from giant cranes. The inhabit units are also just wide enough to fit on a truck. They are 20 percent sturdier than they need to be, with about 10 percent more structural material, which helps them to withstand the trip down the highway (a “minor earthquake,” according to Egan) and provides redundancy when they are assembled. The basic appeal of the inhabit prototype is in the proportions of the units, minimal divisions of space, and the windows, which are floor-to-ceiling, fiberglass-framed cuts that push it from ordinary to ultra-urban. And as the many models produced over the last two years show, they stack and snap together in a variety of ways that allow for courtyards, multi-level outdoor walkways, decks and green roofs. Floor plans are flipped and jogged for different entry experiences at individual front doors. In addition to personal entrances, residents get light, air and ventilation from at least two sides of each unit. There is a long list of sustainable materials and features in inhabit units, and all of these gain in importance as the design type is replicated. But their main claim to sustainability, according to architect Tammie Schacher at Mithun, is the efficient use of wood and other materials. Because of the factory controls and standard dimensions of the material components — including wood framing and cement-board panels — there is very little waste. Its sturdy construction, essential urban design elements and adaptability allow many combinations, and low numbers. “In site-built construction, below 20 units, you really don't get much economy of scale,” said Unico President Dale Sperling. To get that economy (and make a project pencil out) “you need a couple hundred units and a site of about two acres,” he said. 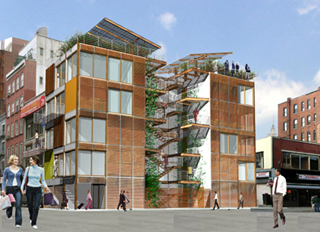 This unbuilt concept from California-based architect Michele Kaufmann takes her pioneering work in modular construction to the multi-family scale. Unico's interest in worker housing really started three or four years ago, he said, after a poll showed that about 85 percent of the people who work in company-managed downtown office buildings do not live downtown. This is basically unsustainable, he said. As the University of Washington's real estate investment partner, beginning with downtown Seattle's University Tract, Unico does well to take the long view. And since market rents are determined by larger forces, he said, the only way to make downtown or close-in apartments more affordable is to control costs. Unico has already spent plenty of money to develop the inhabit prototype, and no one on the Unico team will speculate on the ultimate per-square-foot construction cost of the ready-to-rent apartments. They will say, however, that the hoped-for savings will involve another aspect of the project: time. Specialized software from Germany translates the design into a file that dictates each cut and joint in each unit. Design changes go directly from the architect to the factory floor. Construction permits are part of the package that arrives at the site, issued by the state's Department of Labor and Industries. On-site construction — along with neighborhood disruption and noise — is as little as half the time needed for conventional methods. “It's all about quality, speed and the ability to surgically control cost,” said Egan. Unico has yet to announce specific sites, but is zeroing in on several. Then work could begin on an initial production run of 300 to 500 units, according to Sperling. It's an ambitious effort for a private company. With public support, the Germans, Dutch and British have produced durable and livable modular housing in wood and steel. In the U.S., according to Egan, support for research into pre-fab construction dried up with the Nixon administration. In the meantime, the mass market has given us the double-wide — that American stand-by — stapled with more and more traditional fakery. Structurally and aesthetically, it's been a race to the bottom, said Egan. Now it's more like a race to the top. New York's Museum of Modern Art has taken up the cause, inviting a handful of European and American designers to design and build prototype pre-fab projects, assembling them in a vacant lot that MoMA has designated for the project. Starting in mid-march, the five participating firms will be posting their progress, including delivery and site assembly, on a blog at moma.org. Oakland, Calif.-based architect Michele Kaufmann, who committed herself to pre-fab design and construction years ago, has formed partnerships with a handful of construction plants, including a factory she bought near Tacoma and renamed mkConstructs. It's only producing single-family homes, but other plants are at work making units for multi-family modular housing, including a 40-unit project now under construction in Denver and a larger one in the Bay Area. She has made a reputation for pre-fabricated housing with her Glide House and other prototypes: site-adaptable, modern answers to the site-built suburban home. They've been popular, but Kaufmann admits that the per-square foot cost has been disappointingly similar to site built. She's glad to quote some typical on-site multi-family construction costs (including site-built foundations): $160 per square foot in the Bay Area and $130 in Denver. Like the Unico team, Kaufmann says that owner savings accrue from faster and more predictable construction. 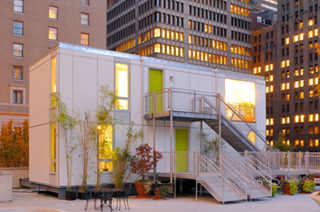 Pre-fab design and construction lets you “pre-package the green solution. The factory can take on the liability for (sustainable) products that are new.” This gives developers and consumers an added level of confidence along with the savings of mass production, she said. Despite the surge in interest, Unico — along with HyBrid, Mithun and Kaufmann — is going against the grain. They're working to create an alternative in a world where the architecture profession seems devoted to serving a small economic and cultural elite while builder-driven McMansions gobble the landscape. It's not easy. Architects at Weber + Thompson, for instance, took the modular route with a six-unit project in Fremont, only to have the Canadian factory they were partnered with go out of business midway. When it comes to modular or pre-fab design, it's way too soon to say “affordable.” In the meantime, our own pre-fab pioneers have gone a long way toward realizing a new building type, one that controls costs, reduces impacts on the environment and lives long and well. Call it mid-market, market-rate.